Direct current is an electric current that flows in one direction for about one second or longer. DC is also referred to as monophasic, galvanic, unidirectional and constant current. DC can be reversed, interrupted and surged. One dry cell provides 1.5 volts hence 30 to 40 such cells connected in series arrangements are used. It can be used in the place where electricity is not available. There is less danger of electric shock. The apparatus is a heavyweight of 40 dry cells. It is larger in dimensions as 40 dry cells occupy larger space. Intensity drops are used as equipment. Supply of direct current in homes and hospital is very rare these days but in certain areas. It is still the source of electricity. Because the current obtained from the mains is usually at an EMF 220 to 240 volts, an extra resistance in series is used to obtain 45 to 60 volts output. The AC supply in homes and hospitals is at 220 to 240 volts. 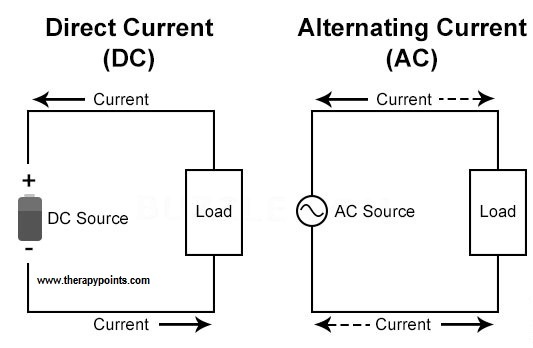 Altering current from the mains is reduced to an EMF of 45 to 60 volts by using a step-down transformer. The current is then rectified, full wave by either using metal rectifiers or thermionic valve. Human tissues are conductors to electric current flow. The electrical current flow in all conductive mediums causes micro vibrations, this vibration and the associated frictional forces lead to the production of heat. Also that all conductors after resistance to the flow of an electric current. Dry skin offers more resistance to the flow of electric current and thus heat is produced. The amount of heat produced is proportional to the square of the total current, the resistance and the time for which the current flows-this is expressed as Joule’s law. Because the DC flows in one direction only, redistribution of sodium (NA+) and chlorine (CL-) occurs thus forming new compounds in the tissues under electrodes. Alkali is formed under the negative (cathode) electrode. The release of hydrogen under the cathode and oxygen under the anode may be involved in a further chemical reaction at cellular level. If the channel reactions are not excessive, blood flow is increased in order to restore normal pH of the tissues. When the chemical changes exceed the body’s ability to restore them to steady state blistering or even a chemical burn of the tissue can result. Pain relief is due to the removal of the increased concentration of H+ and K+ ions which Accumulate in ischemia or inflammation. The anode easily repels the small hydrogen ions. A low dosage for a maximal length of time yield good results Usually 0.1 to 0.25 mA/cm2 for 15 to 30 minutes is recommended. Anodal galvanism used for acute painful conditions. Because marked irritation is caused under the cathode, the effects are sometimes referred to as counter-irritant effects. 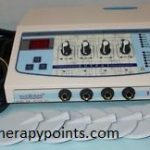 Marked vasodilatation produced by the cathode helps to remove the pain factor thus relieving pain. Irritation effects also act on large sensory fibers to inhibit pain at the spinal and pre-synaptic inhibitory mechanism. A higher dosage is usually recommended, 0.5 to 0,8 mA/cm2 for 5 to 10 minutes yields good results in chronic painful conditions. Because the flow of DC brings about electrochemical changes at the cellular and tissue levels, it changes skin pH under the electrodes and causes reflex vasodilatation and thus improving the cutaneous circulation indirectly. 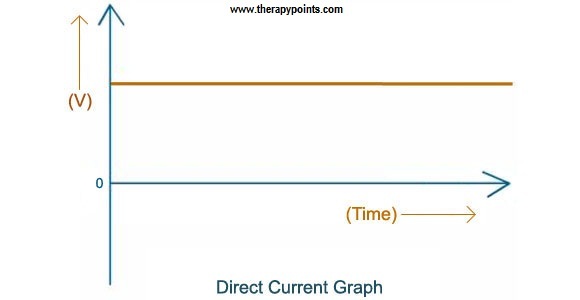 2018 therapypoints.com Design. All rights reserved.